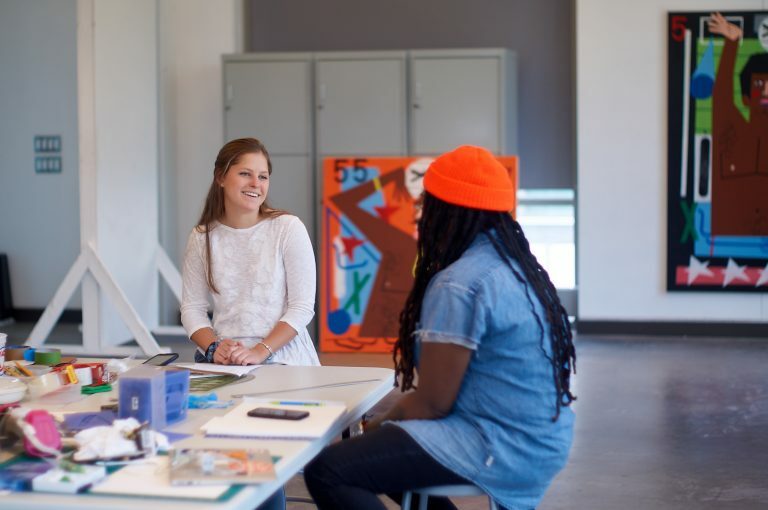 Duke student Annie Kornack interviews artist Nina Chanel Abney about her residency at Duke and UNC this spring. 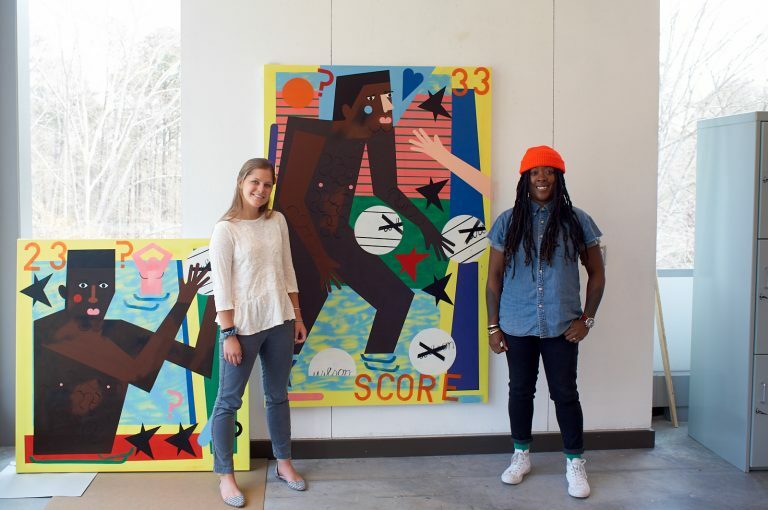 During her spring 2018 residency at the Rubenstein Arts Center, Nina Chanel Abney produced new work, visited classes, and undertook a collaborative mural project with students in a visual arts class at UNC-Chapel Hill (ARTS 290, taught by Brian Garner). 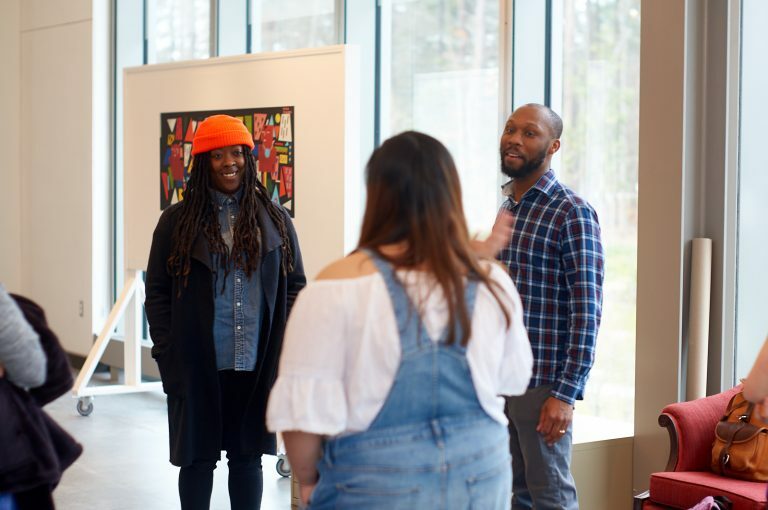 Abney was among the first artists to hold a Nannerl O. Keohane Visiting Professorship, a joint program of the provosts of UNC-Chapel Hill and Duke University that brings scholars to both campuses for residencies intended to advance social engagement and innovation. 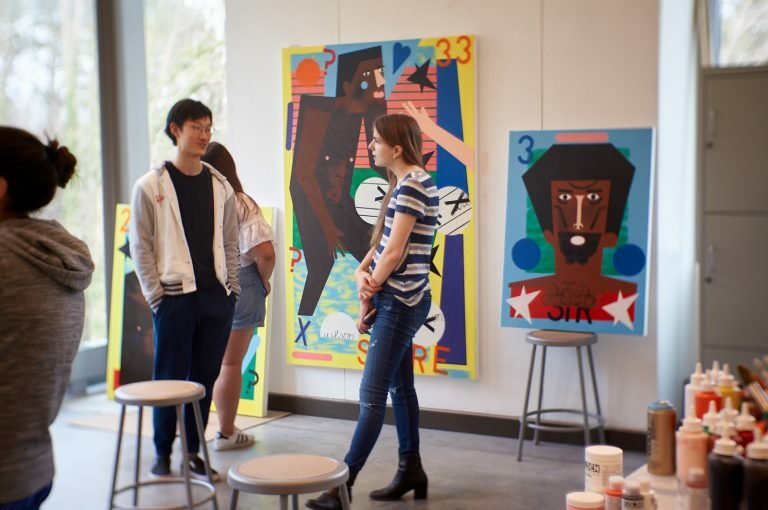 Amid spray-paint and canvases in the Ruby painting studio, Annie Kornack (Class of 2020) interviewed Abney about her time on both campuses. Kornack is a member of the Duke Arts Creative Arts Student Teams (CASTs). Abney in the painting studio at the Ruby. All photos by Robert Zimmerman. Annie Kornack (AK): What attracted you to this professorship opportunity between UNC and Duke, and what were you hoping to gain from this university experience? Nina Chanel Abney (NCA): I didn’t know what to expect when I was invited. I don’t have any teaching experience, but I thought it would be a great opportunity for me to test the waters working with students. AK: What has the Ruby studio space meant to you? NCA: Well, honestly, it’s been a good break for me. I’ve been working on so many exhibitions, it’s been nice to finally have a space where I can take a little time to experiment and create some paintings that might not be for a specific exhibition. Usually, when I’m making work, I always have a particular body of work in mind, and this time I was just casual about it, so it’s been nice to have that time and no pressure. AK: Can you tell us more about what you have been working on in the studio? NCA: I decided to take a break from work that’s based on current events. I decided I want to look at vintage basketball cards. That’s what influenced the work I’m doing now. As you can see there’s volleyball and water polo—I’ve been thinking about sports-related work. I was a big sports card collector when I was younger. New work by Abney created in the Ruby. AK: Have you become inspired by any new narratives by working with college students on two campuses, which can be hotbeds for conversation? NCA: At UNC-Chapel Hill the basketball court was a really collaborative experience where the students brought different issues on campus to me and helped me find imagery related to those issues. We worked together in coming up with the concept behind the basketball court—it responds to Silent Sam from the student body perspective. AK: This basketball court is more collaborative than your commissioned pieces, how does your approach to this differ from your other outdoor mural projects? NCA: I designed another basketball court in Memphis, but I sent in the design and someone else painted it for me. This is the first time that I will be actually painting on the court. The students are doing a lot of the work. We’re working on a poster to advertise the unveiling of the court, we’re doing a photo booth, and people in the class are also painting the court. 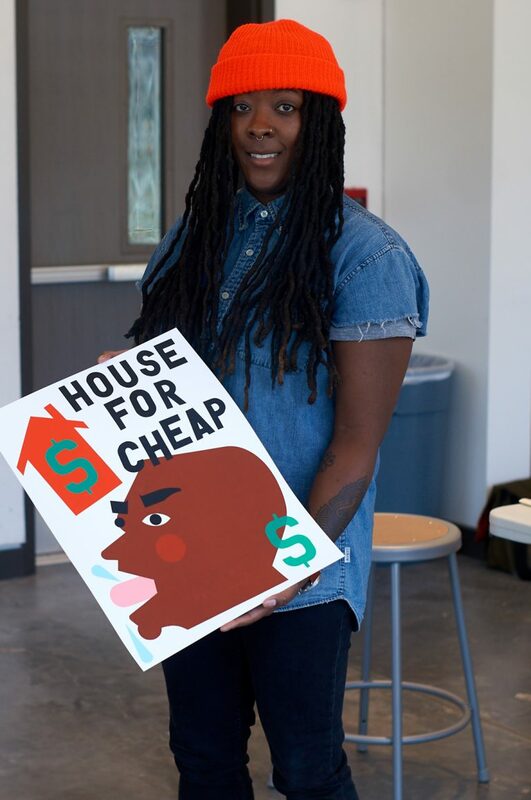 Nina Chanel Abney traced her mural progress on her Instagram (@ninachanel). AK: I think your residency between the two schools shows students how close Duke and UNC are and how easy it is to use the resources of both. I know we always joke about the rivalry, but I think that there’s a lot to learn from the other campus. Have you felt a sense of community while here and how has that impacted you? NCA: I’ve had a lot more opportunities to engage with different students, which I never get. I actually talked to a hip hop class, where I lectured about the influence of hip hop on my own work and it made me look at my work in a different way. Getting a chance to pop around different classes allows me to focus on different aspects of my practice that I normally wouldn’t necessarily think or lecture about. 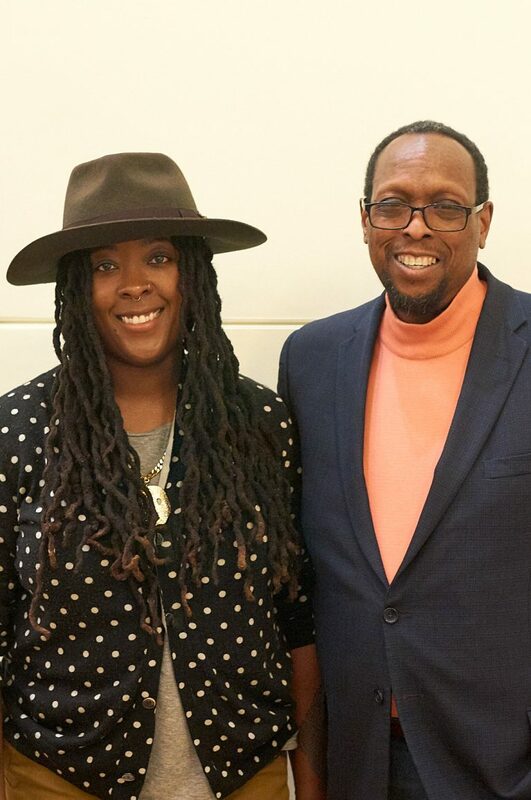 AK: I think that it’s inspiring and innovative the way that you go about creating your pieces, not only for museum exhibitions, but also for online content, outdoor murals, and commercial products. It’s nice to see an artist who’s trying to reach everyone at different levels. NCA: I really would love to do more commercial. Through that I’ll be able to reach a much larger audience. And I love Instagram, several people have been getting their nails done with my artwork. I usually repost them—it’s fun how my art can translate differently. 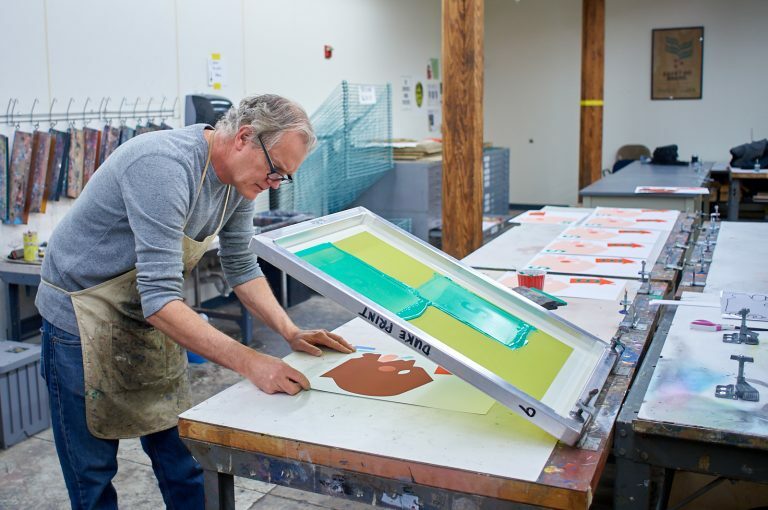 Abney visits Bill Fick's screen printing class. AK: I was actually looking through your Instagram posts regarding the UNC basketball court and saw that someone commented on a post saying, “The court designed by Nina would be a good addition to the Barack Obama Presidential Center.” And I was instantly though how that would be cool. NCA: That was my mom! (Laughs.) That was totally my mom in my Instagram comments. AK: Well she has a fantastic idea! How would you tell students to go about starting a career in the arts? NCA: I would say, just do it and you’ll learn as you go along. AK: What have you gained personally, creatively or professionally from this professorship and residency program? NCA: I have looked more at collaboration. Especially working with the class at Chapel Hill, it’s just a true collaboration. 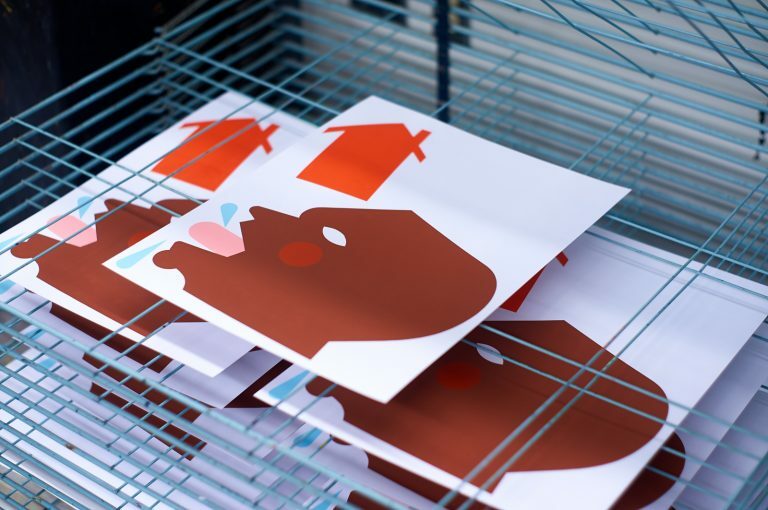 Nina collaborated with Fick on this screen print—Fick gave her a quick lesson on how to adapt her stencil cutting process to the printing medium and printed her design. AK: This is my one of my final questions… and know that there’s only one right answer. Who’s better, Duke or UNC? AK: There you go, honest answer! And lastly, what are your plans after this professorship? NCA: I’m doing a private residency in Arizona for a month. So, pretty much after I leave here I’m going to Arizona, near Scottsdale. I’ve never been, but it looks pretty amazing.